The world’s only Porsche 918 Spyder painted in Voodoo Blue is heading to Barrett-Jackson’s Las Vegas auction on October 19-21. For the past two years, the unique 918 has been displayed at the Rock and Roll Car Museum in Texas and will cross the auction block with less than 1,200 miles on the odometer. While the reserve hasn’t been made public, there’s a very good chance this could become one of the most expensive 918’s sold. As the images show, the car hasn’t been fitted with the desirable Weissach Package but following its delivery, it was completed with a styling black, white and grey Martini livery to ensure it stands out even further. The hypercar is also particularly special because it has silver brake calipers instead of the Acid Green calipers fitted to most 918’s. 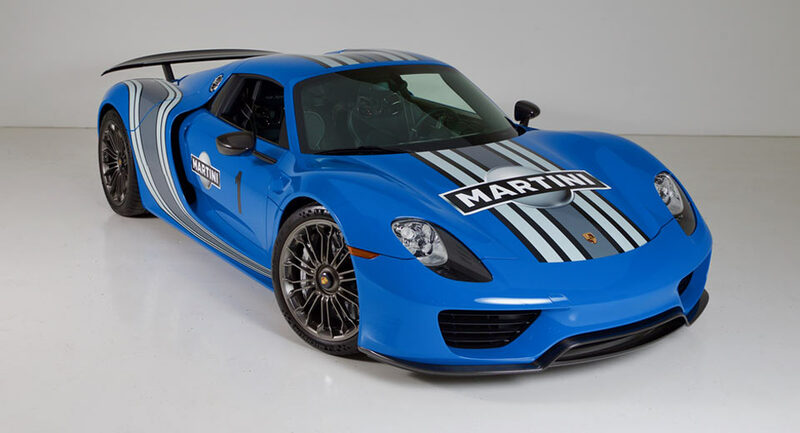 0 Response to "World's Only Voodoo Blue Porsche 918 Martini To Be Auctioned"